For as long as I can remember, the Christmas Tree has held significance for my family during the holidays. The boxes of ornaments and decorations always came out the day after Thanksgiving. We never and I really mean, never had a real tree. They were messy and dropped needles, and that was not going to fly in my house. So we had fake trees, but truthfully, I didn’t care, because to me, the Christmas tree was going up. After dad put together the tree, my mom decorated it. We collected some really cool ornaments over the years that I am pretty sure still goes on the tree to this day. There is one we affectionately called the “Parachute Dude”, which was Santa attached to a parachute that was hung from the lowest branch on the tree so you could see it really well. After I married, my husband didn’t want the tree to go up until after his birthday. You see, he’s a December baby. December 19th to be exact. He always felt cheated out of his “special day” because it was so close to Christmas. I honored his wishes, but he had to put up the tree the next day. And, of course for him, he wanted to have a real tree. So, off we went and got our tree. We had one for many years which he put up in ane old stand that he had from his days as a bachelor. 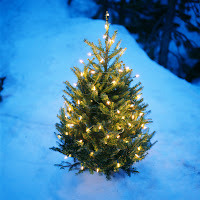 One year, while we were still living in Arizona, he even decorated a small tree outside our home with lights. I remember that it was an incredibly cold and snowy winter that season. He went outside and decorated especially for me. What a guy! He really is the best husband ever because he made my secret dream to have an outdoor Christmas tree finally come true! It looked similar to this one, and it was soooo cute! I’m not sure when it happened, but we both got tired of the real tree and the mess, not to mention the cost. $90.00 for a tree!!! I don’t think so! 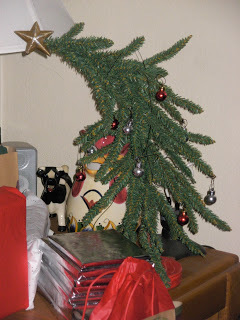 We went to K-mart and bought a fake tree which we used for several years. We’ve had a couple of new ones since then because it seemed like they made improvements every year. I was really inspired the year after we returned from our trip to Hawaii. I knew that I didn’t want the same old tree. I really wanted something to remind us of the wonderful and magical time we had in the islands. Without any resistance from my better half, I went ahead and ordered a new tree to put up that year. Since I decided we were going to do something different that year, we were really going to do different! 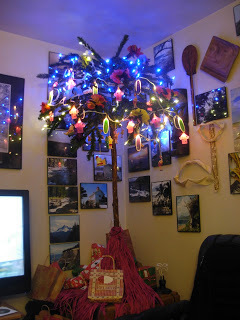 When the box arrived and we opened it up, out came the Palm Tree that I wanted for our Christmas Tree that year. Since that first time, we have put it up a couple additional times depending on our mood. It’s a lot of fun and we will always remember that great vacation we had in Hawaii! This year, because we really don’t have a lot of room, we are doing something even more different. Keeping my theme of simplicity in mind, we’ve decide to put up a “Whoville Christmas Tree”! Very simple, very easy. Hoping you all find the Christmas tree of your dreams this year! I’ve written this post for the 12 Days of Christmas Challenge, sponsored by the Casa De Hansen. 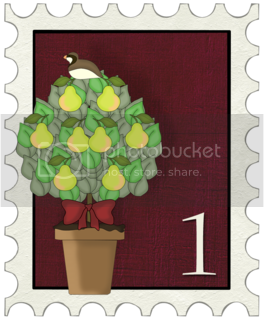 Today’s topic is Christmas Tree based on the 1st Day of Christmas: “A Partridge in a Pear Tree” .